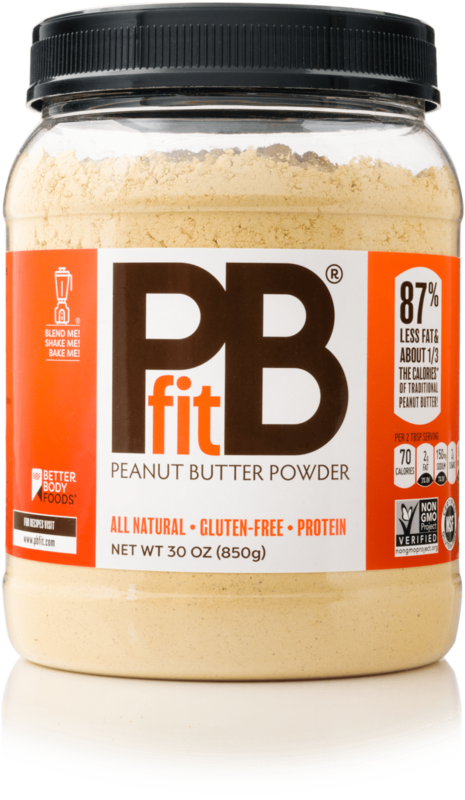 PBfit is a natural peanut butter powder with 87% less fat and about 1/3 the calories of traditional peanut butter. Because it is a powder, it is easier to use in smoothies, baking, and shakes of all kinds! Click HERE for information about our recent Nutrition Facts update. Do PB&J the leaner way — PBfit has 87% less fat and about 1/3 of the calories compared to regular peanut butter (when prepared as directed), yet it’s made from real roasted, pressed peanuts. Deliciousness defined — For a delicious, low-fat peanut butter spread, combine 2 tbsp. PBfit with 1 ½ tbsp. water. Stir until smooth, and spread anywhere you would put normal peanut butter! Protein power — Each serving of PBfit is packed with protein, you can get a boost of protein right before your workout. Try adding it to the protein powder you already use! Simple ingredients — PBfit is made with 3 simple ingredients in Classic PBfit and 4 in Chocolate. The best thing is that you can pronounce all of them! Classic: peanuts, coconut palm sugar, and kosher salt. Chocolate: peanuts, sugar, cocoa and kosher salt. Did we mention it’s all natural and gluten-free? Blend, bake or shake — Mix into bread, pancakes or waffles to create a great peanut butter flavor. Toss a few spoonful’s into smoothies or shakes for a tasty, low-fat, protein boost. People go nuts for PBfit and here’s why: they don’t expect it to taste as good as regular peanut butter. So when it does, they get super excited, even a bit obsessed. Imagine snacking on peanut butter that’s only one-third the calories and 87% less fat compared to regular peanut butter (when prepared as directed). That means guilt-free smoothies, PBJs, peanut butter dips, oatmeal, pancakes—you get the idea. It’s your new non-guilty pleasure. BetterBody Foods PBfit is made by gently roasting peanuts, and then pressing the peanuts to extract the majority of the oil from those peanuts. This process reduces the unnecessary fats that is found in regular peanut butters, but it still leaves a delicious, low-fat peanut butter powder that is chock full of flavor. For a low-fat peanut butter spread, combine 2 Tablespoons of PBfit with 1.5 Tablespoons of water. It also gives a delicious protein boost to smoothies. You can also try substituting PBfit for flour in your favorite baked goods recipes. PBfit is packaged at BetterBody Foods’ world headquarters in Lindon, Utah. 87% less fat and about 1/3 of the calories*, yet made from roasted, pressed organic peanuts. Grown without synthetic fertilizers in high-quality, properly maintained soil. Combine with water or add to smoothies and get a natural protein boost with the great taste of real peanuts. This does not even compare with other peanut butter powders! I use this every single day in my oatmeal and smoothies…on top of sprouted grain toasts, on pancakes. I’m in LOVE!